Continuing the theme of Kid friendly healthy beverages suitable for the hot summer days, I picked up this nutritious drink for today. 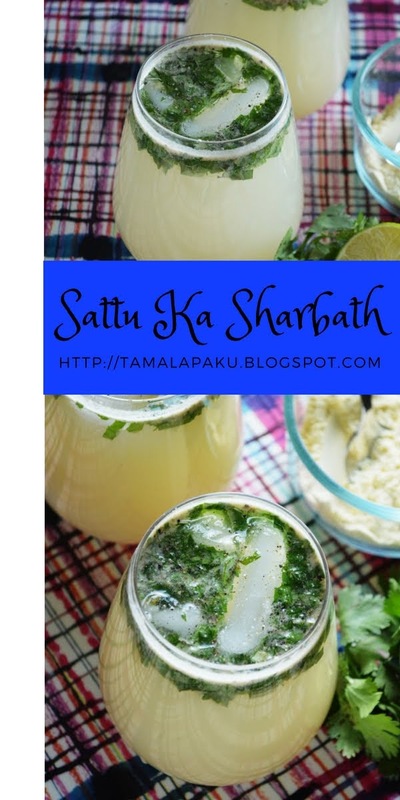 There are scores of recipes on the internet on how to make Sattu Ka Sharbath. Apparently it is very common in the states of Bihar and UP. As I came to understand, Sattu Flour is basically Roasted Gram Flour. Traditionally black chickpeas are roasted and powdered at home. I took the easy route by powdering the Roasted gram (Dalia/Putnalu) itself. Make sure to mix well before serving and while drinking too. The sattu flour tends to settle down at the bottom of the glass. In a mixing bowl, add all the ingredients, mix well, adjust the taste as per preference. Transfer into individual serving glasses and garnish with more coriander and mint leaves. Sattu flour as the main ingredient of a drink is so surprising. It looks really good and I am sure tasted great. Ever since I read this recipe, I keep wondering how it might taste as we are quite familiar with eating the pappulu as such or as podi..I am yet to try my hand making this drink. I love how those fresh leaves have come to the top. Looks so classic Harini. Heard lot about this sharbath, but never had a chance to prepare or taste. Now i have a reason to prepare this drink. Yes its getting hot in Paris. Thanks for the share Harini. Heard about this beverage,but never tried.Must be a refreshing and delicious one.. Interesting one. My husband lived in Ranchi for a while and he was mentioning that the drink is sold on streets in the morning and people stand in lines to drink this. I always wondered how this tastes as well. I have heard of this sherbath before, but never tried it personally. The drink looks easy to make and really good for this heat. That is a different kind of drink. Perfect for summer and nutritious as well. Roasting the Dalia sounds like a good option to make it easier. Wow a drink out of sattu, amazing...Looks so refreshing. Have heard a lot about Saatu Sharbath but ever tried one for myself.. U have tempted me a lot!! Have never tried sattu me sherbet....looks like a must Try! Love the pics!